It’s amazing how long it takes the industry to catch up to us. We strongly suggested windows and pay-gates at ad supported streaming services (Spotify) to drive conversion rates to subscription revenues back in 2014 and again in 2015, twice! Wow, windowing works! Who knew?! But here’s the real kicker, the labels are LOWERING royalty rates in exchange for the ability to window hit records! It’s unbelievable that the industry must always take two steps back for every one step forward. Does it really need to be this hard? If the record industry is serious about growing streaming revenues (and the digital economy in general) it must address the problems with the exploitative practices of Google’s YouTube. We’ve been lucky to be supplied with Content ID data from the same source as our previous data – so we added that into the mix to see where it would rank. These numbers are just staggering. If you combine Content ID to the YouTube Subscription numbers you arrive at a whopping 63% of total streaming market share that only contributes 11% of revenue. Ya’ll taking notes here? Look at the combined YouTube revenues of Subscriptions and Content ID together at 11% of revenue. That puts the combined earnings at #3 in market share behind Apple Music. However, Apple Music creates more earnings than the two combined YouTube Revenue streams with less than 4% of the consumption. You’ll also notice that YouTube is the only streaming service with three zeros following the decimal point. That means YouTube is paying hundreds of dollars per million streams while the other leading streamers are paying thousands. Apple Music generates 12% of revenue with less than 4% of streams. YouTube generates 11% of revenue with 63% of streams. Does that sound like a problem to anyone else? As of this writing we’re not factoring in the direct channel uploads for artists to YouTube or Vevo, however we just can’t imagine that those numbers are much different in terms of plays versus revenues. We hear from a lot of label folks that they are afraid to give up their annual revenue from YouTube sources, but all we can say is that you’d be gaining more much more than you would be giving up. We’ve heard of at least one executive who met with resistance when faced with the prospect of potentially walking away from millions of dollars a year in YouTube revenues. But, it’s not walking away from millions, it’s giving up 10’s of millions in true revenue. It’s time for the record business to get serious about cleaning up YouTube. We can’t make this up. We’ve stated many times before, as the consumption of streams increase (and those services grow) the per stream rate will drop as revenues level off. This is simply because revenues can not keep up with consumption, and there is no fixed per stream rate. In our latest look at streaming rates we found that Spotify streaming rates had dropped 16% from 2014 to 2016. Now, Hypebot is reporting that Spotify is asking for another 14% reduction in royalty payments. 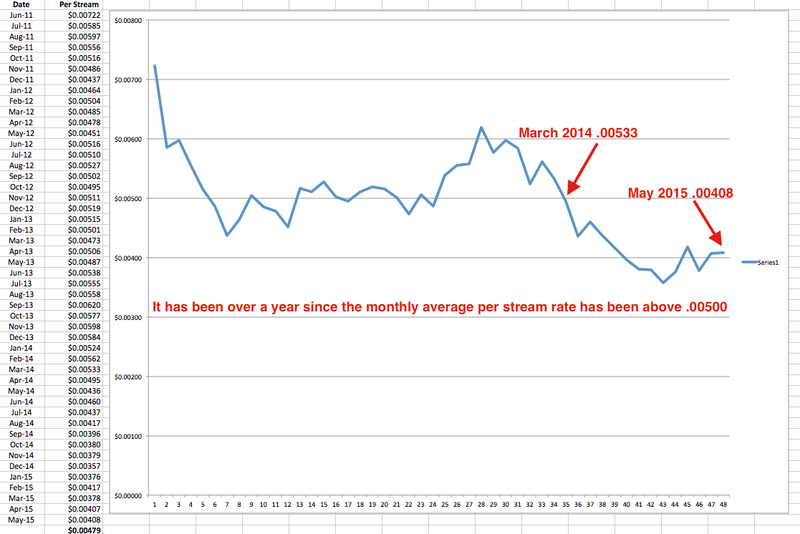 Please someone break out a calculator… that would be a 30% reduction in per stream rates in two years! It’s just math. Wow. Updated! Streaming Price Bible w/ 2016 Rates : Spotify, Apple Music, YouTube, Tidal, Amazon, Pandora, Etc. The last time we did this was back in 2014, so we thought it was time for an update. Not a lot of surprises but as we predicted when streaming numbers grow, the per stream rate will drop. This data set is isolated to the calendar year 2016 and represents an indie label with an approximately 150 album catalog generating over 115m streams. That’s a pretty good sample size. All rates are gross before distribution fees. Spotify was paying .00521 back in 2014, two years later the aggregate net average per play has dropped to .00437 a reduction of 16%. YouTube now has their licensed, subscription service (formerly YouTube Red?) represented in these numbers as opposed to the Artist Channel and Content ID numbers we used last time. Just looking at the new YouTube subscription service numbers isolated here, they generate over 21% of all licensed audio streams, but less than 4% of revenue! By comparison Apple Music generates 7% of all streams and 13% of revenue. Speaking of Apple, they sit in the sweet spot generating the second largest amount of streaming revenue with a per stream rate .00735, nearly double what Spotify is paying. But, Spotify has a near monopoly on streaming market share dominating 63% of all streams and 69% of all streaming revenue. The top 10 streamers account for 99% of all streaming revenue. To put this list in the context of our 2014 numbers we’re adding the chart below with the data sorted by the quantity of streaming plays required to match the revenue of a single song or album download. This is important as we work towards defining and setting a fair per stream rate and also setting an accurate economic equivalent of streams to songs and albums for the purposes of charting. Keep in mind every streaming service has a key piece of data that would allow artists and labels to set a fair per stream rate. Every on demand streaming service, Apple, Spotify, Tidal, Google Play all know how many times a song is played (per person) on average over time. This is the data that is key to setting fair streaming rates. Who will share this information? Apple, Jimmy Iovine, we’re looking at you.